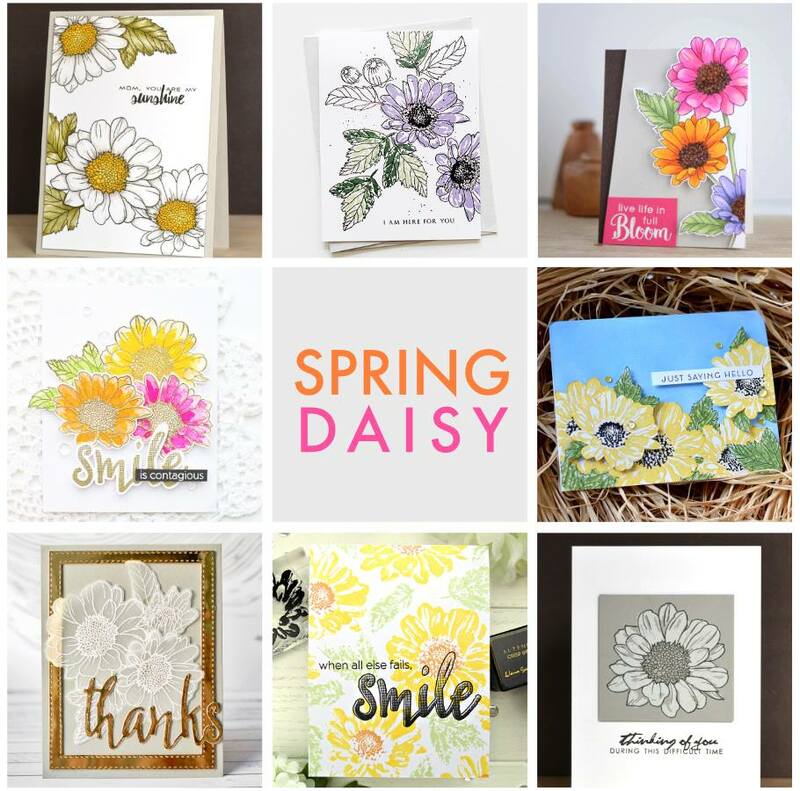 I’m over at Altenew blog today sharing several ways of using new amazing stamps set – Spring Daisy. This set is incredible, one of my favorite in this release. The flowers are so versatile and exceptionally beautiful. I have four cards to share today. The first one was very simple to make. 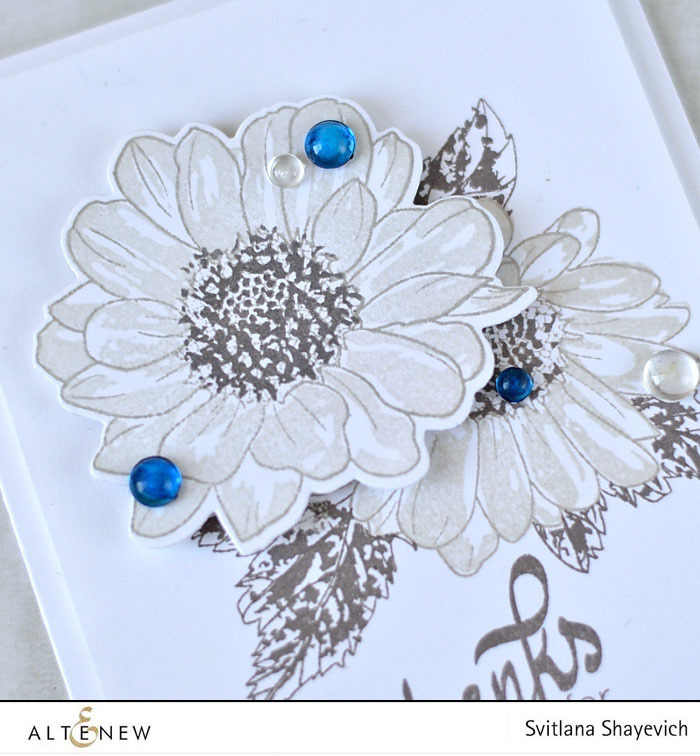 I stamped a floral cluster in on a white panel using Moon Rock, Evening Gray, Morning Frost inks. And I did all stamping with the help of my mini-MISTI. 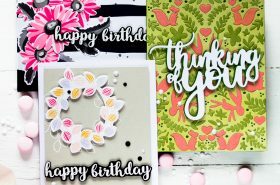 When it comes to layered stamping this tool especially comes handy. 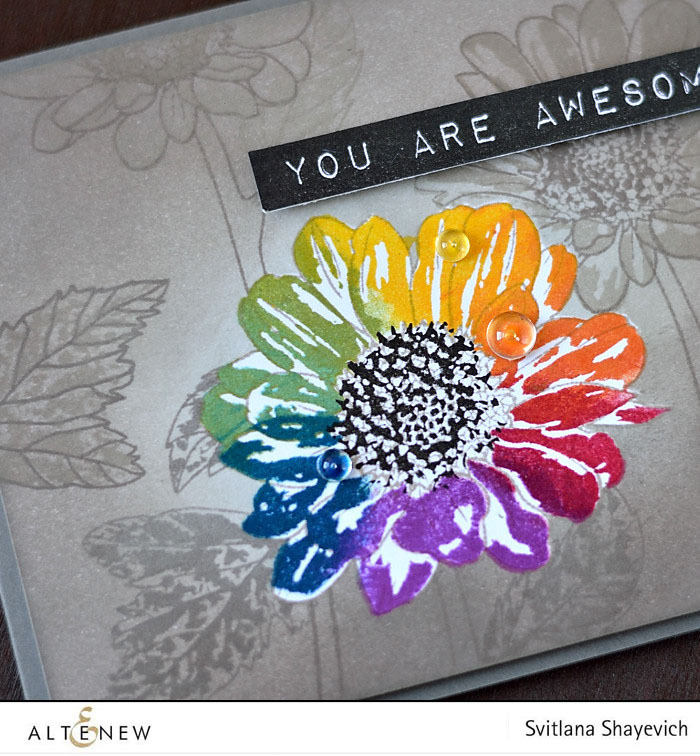 I masked the bigger flower when started stamping the smaller one, so they don’t overlap. And then masked the smaller flower as well when started stamping leaves. 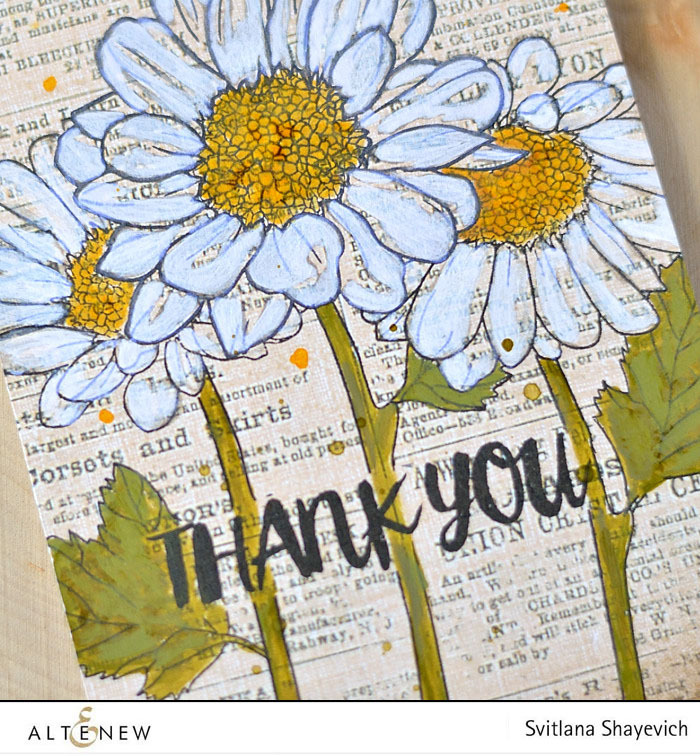 Additionally I stamped aside the biggest flower, die-cut it using corresponding Spring Daisy die and adhered it to the panel over the stamped flower using foam squares. Next I stamped the sentiment from set using Moon Rock ink. I adhered the panel to a white card base adding using dimensional adhesive and added several clear droplets, some of which colored with COPICs to make them blue. 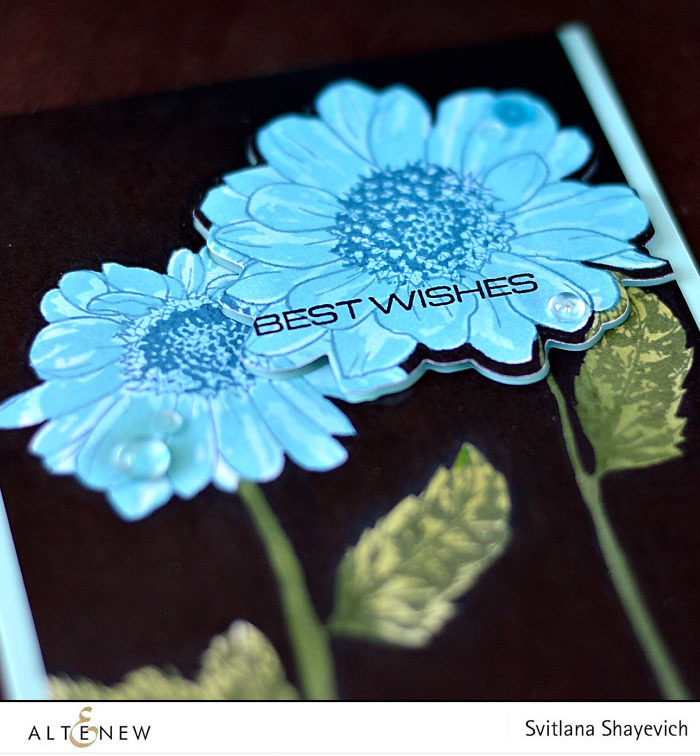 For the next card I first stamped flowers, stems and leaves on white panel. Masking was used here as well to prevent overlapping of images that are positioned on different visual layers. I used Ocean Waves and Dusk inks for flowers and Evergreen for stems and leaves. 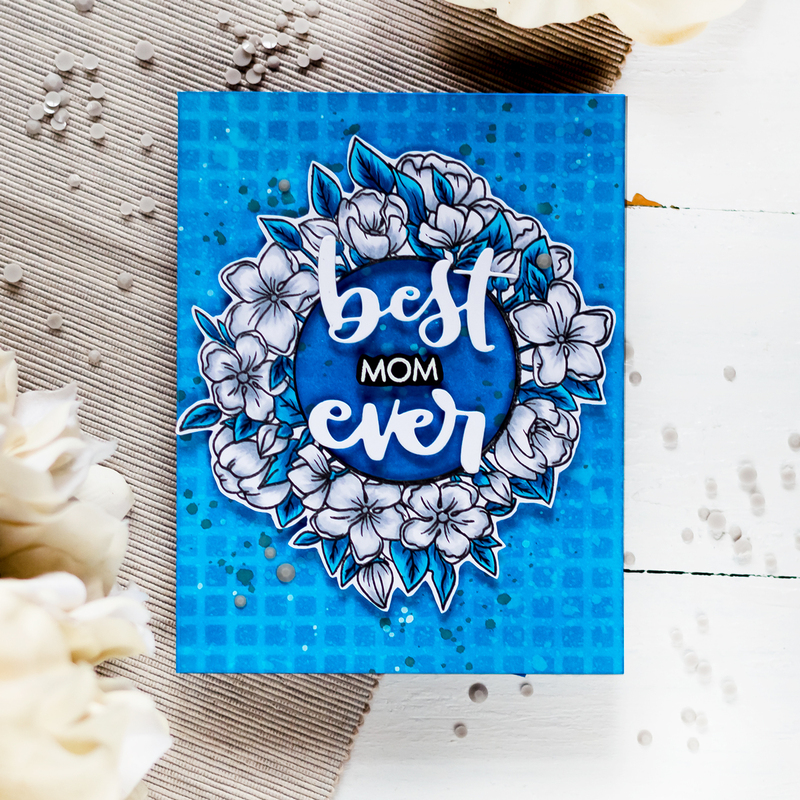 As the white space wasn’t the part of the design I planner I inked flowers with Ocean Waves ink using sponge dauber. Did the same for leaves and stems using Forest Glades ink. I didn’t care about staying inside borders at this point. Just tried not to overlap inking in the spot where blue flowers and greenery meet. I colored the whole background with black marker. At this point I realized that hadn’t thought through where the sentiment would have to be. This happens to me ALL THE TIME haha. I think more then a half sentiments on my cards I made in the mode “damn! forgot about the sentiment! have to squeeze it somewhere now”. 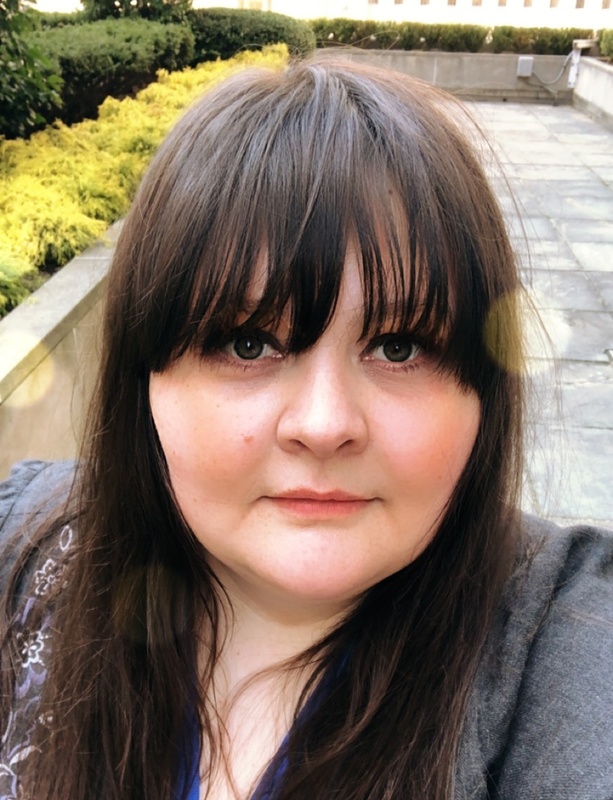 Usually I do a sentiment on a banner, which also can be a way to hide some boo-boos if there are any (another way to hide them are sequins). Sometimes I use a die-cut sentiment. But here I decided just to stamp it onto a flower. 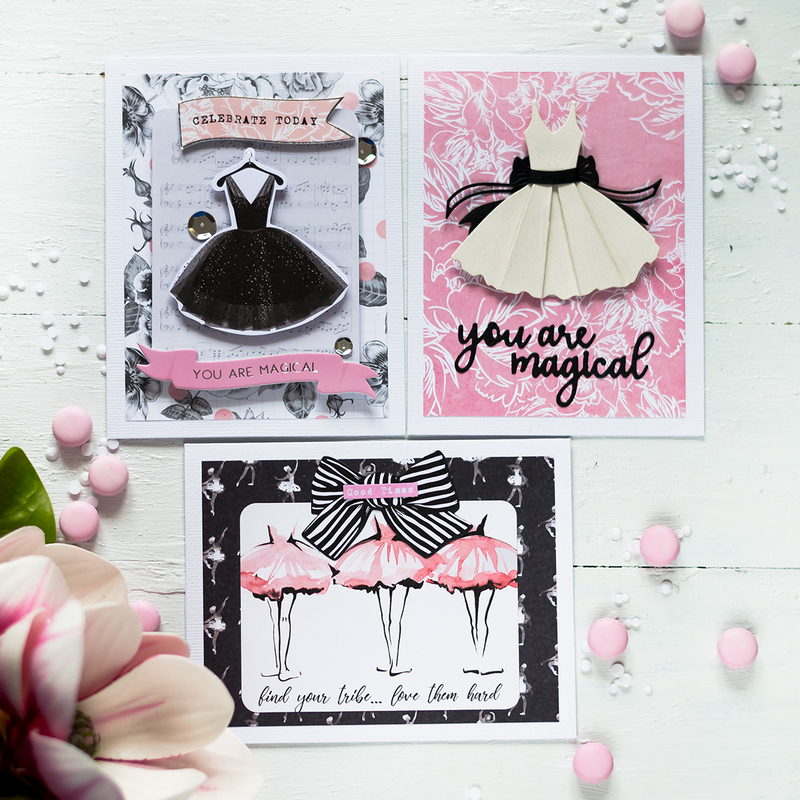 The sentiment I choose from Beautiful Lady set and stamped it using Jet Black ink. For this card I first cut a panel from some vintagy patterned paper. This paper was one of my first scrapbooking purchases about 7 years ago, back when I was living in Ukraine. When I moved to US, I brought literally two pieces of closing and two huge suitcases full of cardmaking and scrapbooking supplies. And now, 7 years later, finally found the use for it. So was totally worth it dragging this paper over the Atlantic Ocean:) Well, at least this paper not only has some vintage design but also has its history. I stamped a sentiment from Oriental Orchid set using Jet Black ink. 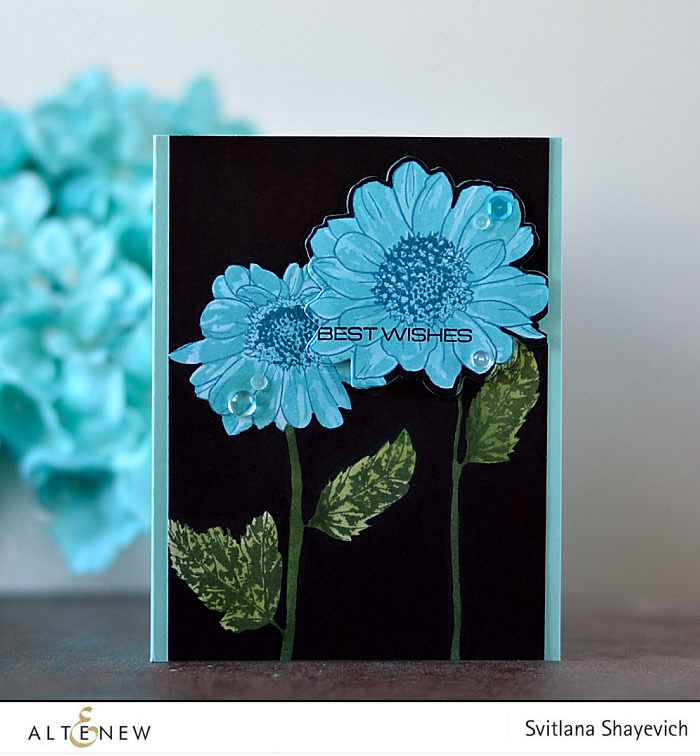 Masked it and stamped flowers, stems and leaves also using Jet Black ink. 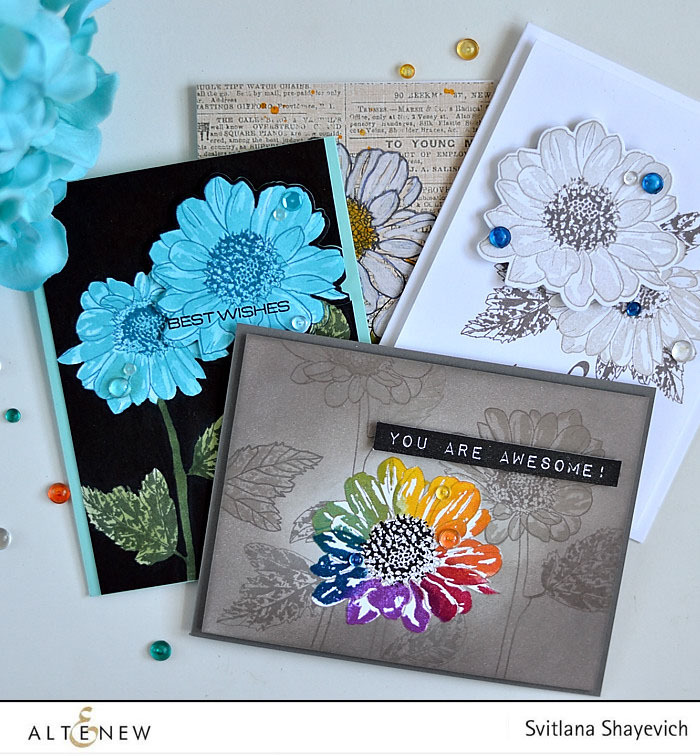 Then stamped the second layer of flowers with Evening Gray ink to make a guide for me of where should I color. Colored flowers with Distress Picket Fence Paint covering areas stamped using the second later of the flowers. Next I colored flowers centers using Mustard Seed Distress Paint, and stems and leaves using Peeled Paint and Shabby Shutters Distress Paint. I added some droplets of the same paint I used for coloring and adhered the panel to white card base. 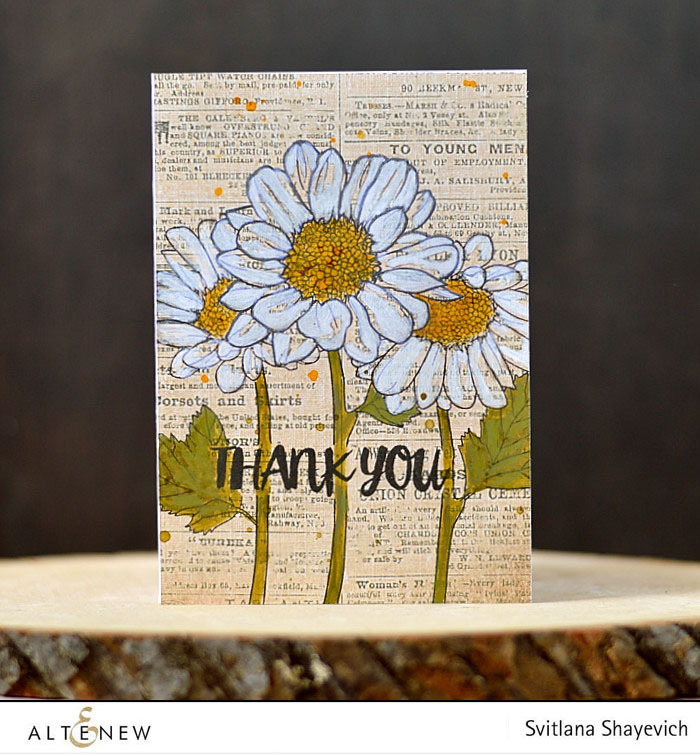 For the last card I first cut a panel from white cardstock and stamped the bigger Daisy using Evening Gray ink. 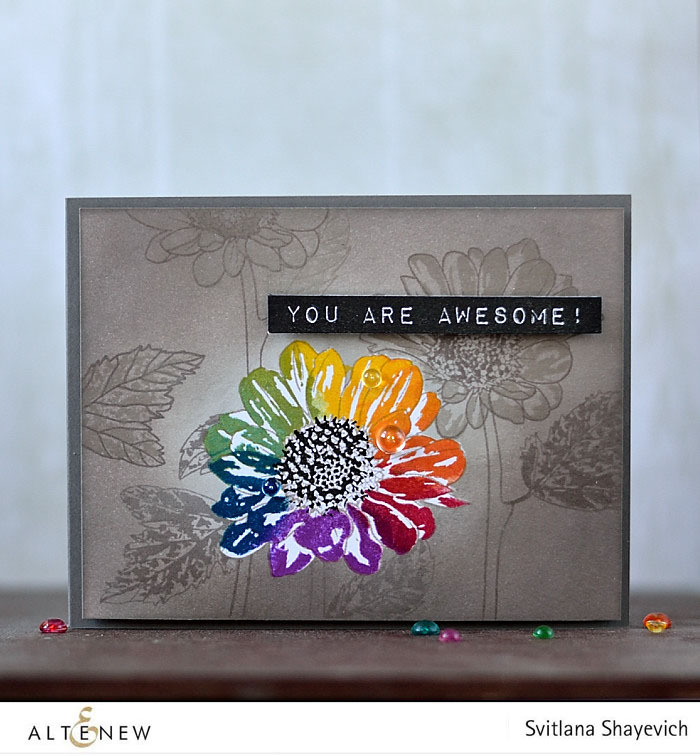 I made petals of this flower colored in rainbow colors stamping the second layer 7 times, each time using different inks. For each color I inked only part of the stamp, dabbed off some ink leaving only several petals inked and stamped. Then I moved to the next color. And of course I used my mini-MISTI to stamp exactly at the same spot every time. The inks I used to create this rainbow are following: Ruby Red, Caramel Toffee, Warm Sunshine, Forest Glades, Ocean Waves, Desert Night, Midnight Violet. 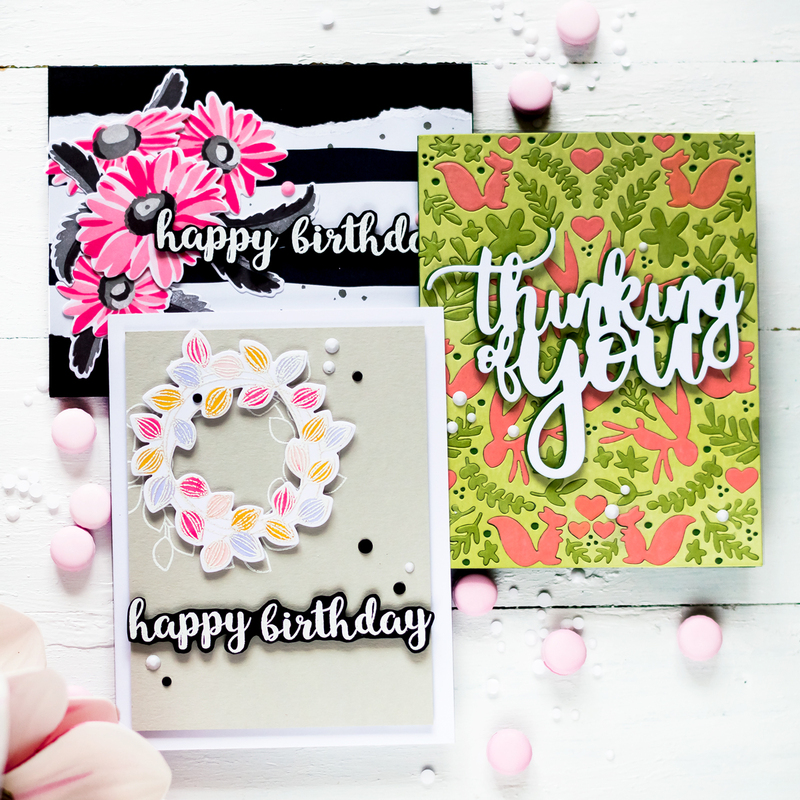 If you want to ideas and inspiration of how this set can be used – I encourage you to check out what our designers made using this set during this release blog hop. Make sure to pop over to Altenew blog as Altenew is part of MISTI May-nia giveaway and you can win a MISTI just by commenting the post. 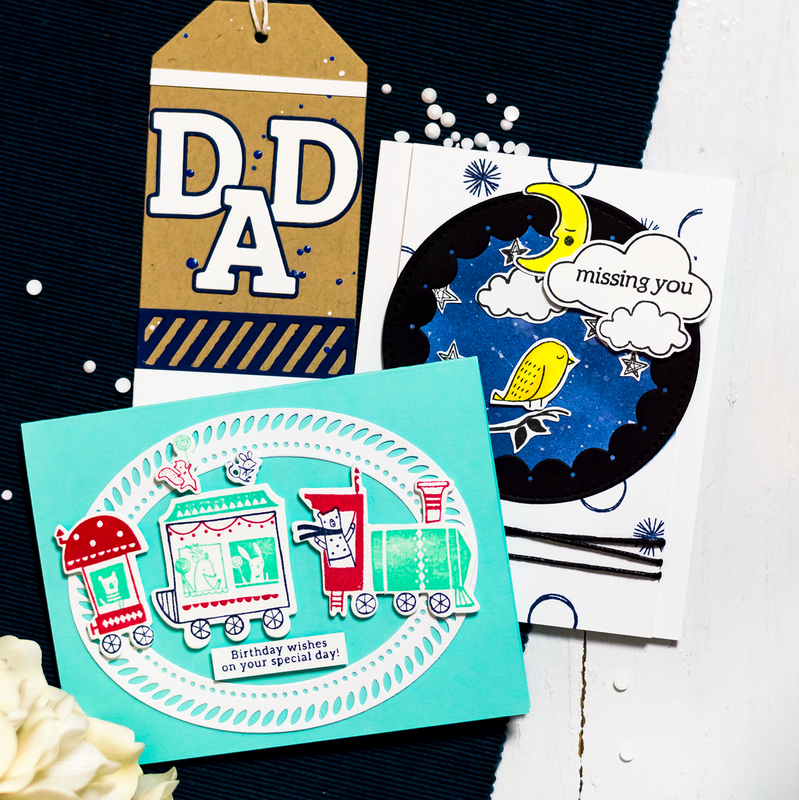 Your cards turned out great! I really like the multi colored daisy. Thank you so much for the process video! Great tips! I love the one on the printed page. It looks great like that. 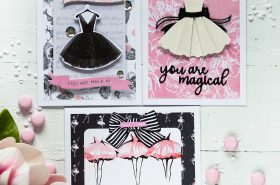 I appreciate your techniques on the new stamp set – very inspiring! The cards are gorgeous! Thank you.